Plunging temperatures sent greenheads scrambling for open water. Waterfowl hunters are different. We relish storms, snow, nasty weather and plummeting temperatures. While most people seek the comfort of a warm fire and a good book, dyed-in-the-wool wildfowlers yearn to be outside on such days. An old wildfowler once told me, "Give me a 10 to 15 knot northwest wind spitting snow and blasting the skin off my face, and I'll show you great duck hunting." The day dawned clear and brisk -- 15 degrees -- following two inches of fresh snow in the night. Ponds had frozen and rivers were full of slush ice. Wherever one could find open spring water, ducks would be using it. A dairy farm I know in the Dakotas has a small spring creek and three spring holes flowing on the south end of the property. After visiting Farmer Brown in his milking barn, Scott Wuebber and I trekked across the pasture to the largest of the spring holes. Steam floated above the water. At our approach, more than a hundred ducks and several dozen Canada geese flushed from the creek. The displaced ducks started to return as we set decoys. But we were easily spotted in our makeshift blind, even though we were wearing whites and remained still. Although we scratched down several drake mallards, our morning hunt was mostly a lesson in futility. At 10:45 a.m., we headed for the truck and into town for a late breakfast. After lunch, the sky turned gray. The temperature was dropping fast. When we returned to the spring hole, the wind had picked up -- a front was moving in from the northwest. We decided to move to the opposite side of the spring hole for better cover. The first ducks arrived before we were ready, and we missed them with skill and finesse. Minutes later, a flock of 25 mallards dropped in without circling. Three drakes stayed. As Wuebber's young black lab, Trico, retrieved the greenheads, more ducks worked the decoys. 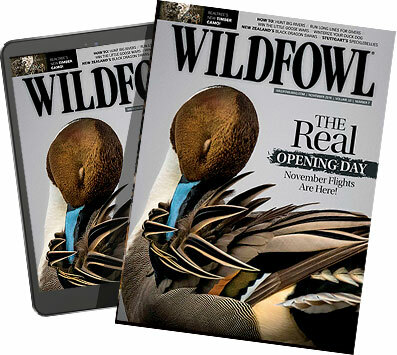 We knew we were in for the kind of afternoon wildfowlers experience only once or twice a season, if they are lucky. We decided to alternate shots -- one gun at a time, drakes only. The wind increased to 15 to 20 knots as the temperature fell below zero. With it, came the mallards. Big, beautiful, fat, fully feathered greenheads served up on cupped wings and flared orange feet. Despite the harsh weather, we took our time and limited easily. The mallards we shot froze solid within 20 minutes. The sky darkened, the wind howled and the snow blew sideways as we retrieved our decoys. When we reached our truck, the wind had subsided, but it continued to snow steadily. The thermometer read minus 18. The temperature had dropped 33 degrees since 8 a.m.
We were very cold, but satisfied duck hunters. Dale Spartas is a professional wildlife photographer from Bozeman, Mont.